With time running out on my Indian visa, I had to chose how to spend my last few days, before returning to Nepal. Somewhat arbitrarily I set my sights on the state of Punjab, home of the Sikhs, and the city of Amritsar in particular. Coming from the intense heat and humidity of Kerala, it was a relief to be back in a drier climate. Stepping off the plane into 30 degree weather, the air felt cool and breezy. Several things became apparent as I approached my hotel in Amritsar. First, this was by far the most crowded place I had ever been. Second, I would almost certainly get hit by a vehicle of some kind (gently, perhaps) if I didn’t make an active effort to avoid it. And third, by virtue of my skin colour, I was the backpacker equivalent of a superstar. Never in my life have I felt so much like a celebrity. Kids and young men were constantly coming up to me to say hello, ask where I was from, or to take a picture with me. Several people explained to me that this was partly a habit among Indians with the goal of making foreigners feel welcome, and partly a desire to practice speaking English. It could definitely be irritating (particularly when people knew no English beyond the initial greeting), though I tried to remain good humoured and generous with my likeness. 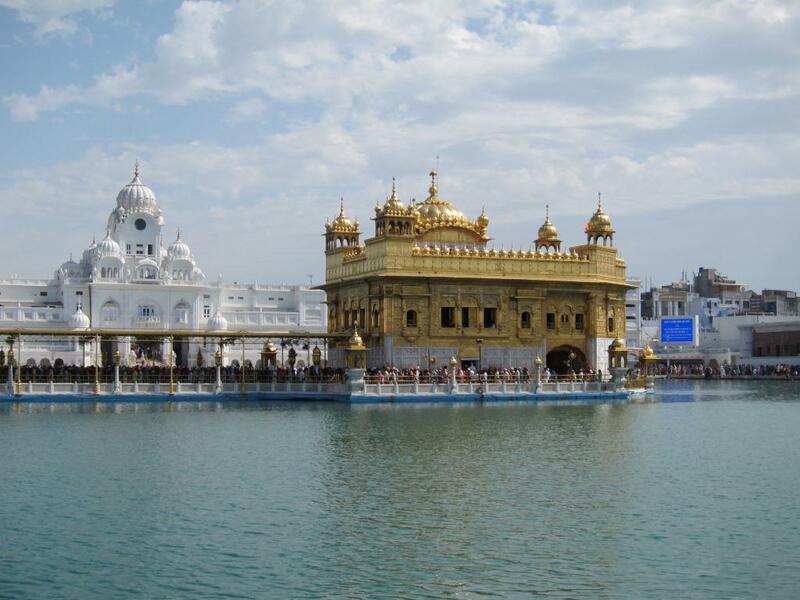 The city of Amritsar is virtually synonymous with the Golden Temple, the Sikhs’ most holy site. Sikhism was founded in the 15th century and, much like Buddhism, was a reaction against the caste structures of the time. Sikhism is a famously open religion, with a firm belief in the fundamental equality of all people. Apparently the Sikhs’ holy book, the Guru Granth Sahib, contains teachings from the Hindu and Muslim religions, as well as from the ten Sikh Gurus. It is also a somewhat practical religion, placing an emphasis on earning a decent living and sharing one’s wealth, as opposed to extreme ascetic practices. All of these characteristics were reflected in the experience of the Golden Temple. 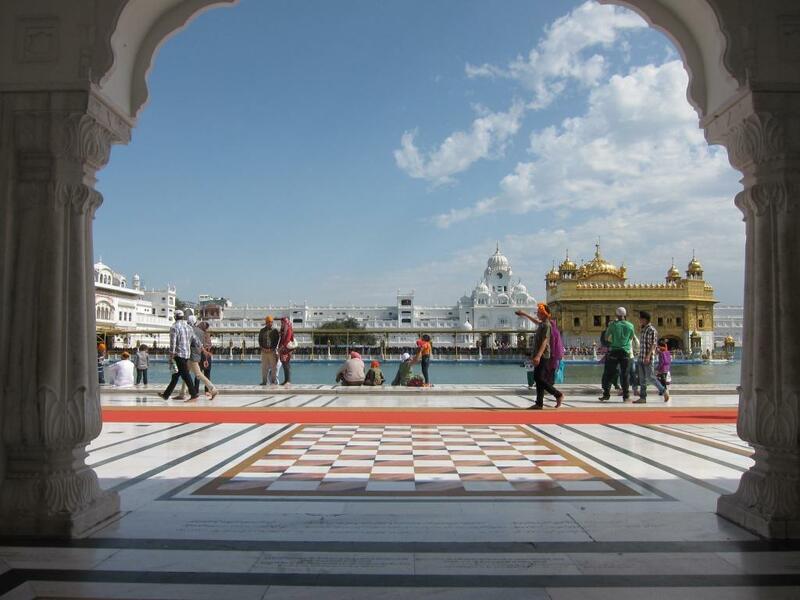 Situated in the midst of a large pool surrounded by a multi-level white building, the two-storey Golden Temple combines elements of both Islamic and Hindu architecture, including beautiful marble mosaic floors. Here’s an image and a recording of the accompanying soundtrack. 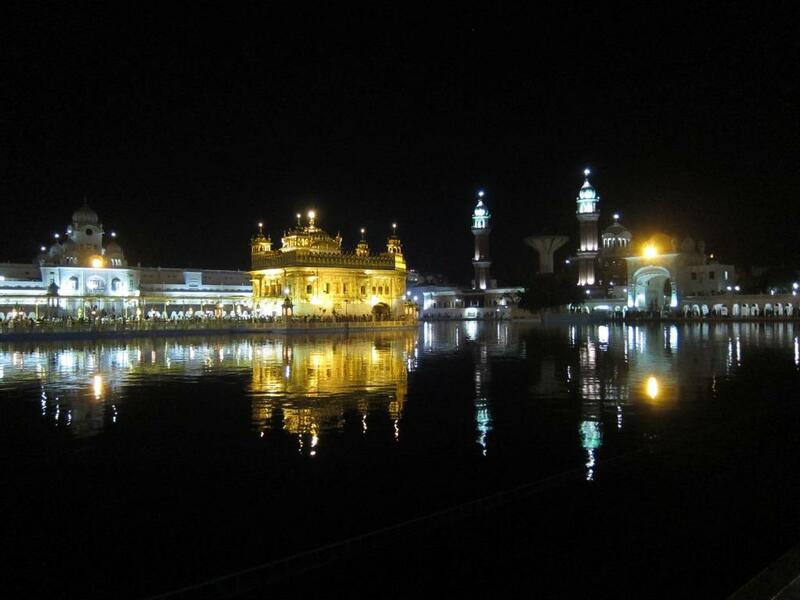 I can happily say that the Golden Temple is the most welcoming religious site that I have ever been to. Unlike so many holy places, the Golden Temple is open to all. There is no visible security, and no requirements for entry, aside from removing one’s shoes and socks, covering one’s head, and walking through a foot bath (with a helpful shoe check and head scarves available at one entrance). This simple requirement, in combination with the beauty of the temple and the enchanting music, achieves a powerfully transformative effect on the visitor. One truly feels as though one has entered into a sacred space and left the everyday world behind. Inside the white walls, large numbers of people are constantly circumnavigating the edge of the pool, with many lining up for hours to walk through the central temple (I didn’t have the patience), and others bathing in particularly auspicious parts of the water (I didn’t have the courage). Most incredible of all, there is an enormous kitchen attached to the temple which serves free vegetarian meals to any one who wishes to partake. Upon entering, you are handed a metal tray, spoon, and water bowl. You then file in to an empty row in the great hall, and as a group sit cross-legged in a row, with your tray on the floor. Servers then come around serving delicious and generous portions of chapati, rice, dal, and raita (a seasoned yoghurt). It’s difficult to capture such an experience in any way other than words, but this recording of the washing of the dishes might give some sense of the scale of the operation. I must make a slight diversion here to note that the food in Amritsar was also among the best I’ve had in India. Punjab was one of the states chosen for the “green revolution”, where high yield crops were introduced to India (not without controversy). As a result, it grows much of the food for both export and domestic consumption in India. There are interesting differences between North and South Indian cuisine, with the later making much greater use of coconut, and particular dishes originating in one part or another, but it’s all delicious. The main reason India is such a food lover’s paradise, is something called a thali. Available as an option almost everywhere, a thali is a set meal, usually vegetarian, and usually incorporating rice, Indian bread (naan, parantha, or chapati), and a number of side dishes, such as dal mahkni, channa masala, vegetable curry, and raita. Basically, imagine having the best Indian meal of your life for somewhere between one and four dollars, depending on the city and venue. I’m happy to say that, at least in Toronto, we seem to have fairly authentic India take-away, though of course the meals here add a little extra in terms of spice, freshness, and subtlety of flavour. Actually, the only time I’ve been disappointed with a meal in India is when I ordered meat (which was not very often). While in Amritsar, I visited the Golden Temple more or less everyday, and every time I ended up having a long, in-depth conversation with someone from India covering religion, politics, family life, the history of India, and Sikhism. All the Sikhs I met were extremely welcoming, as well as being very knowledgeable about and proud of their religion. One topic I was most keen to discuss with people was nearby Pakistan. Over various conversations, I heard a diverse range of opinions, but everyone was happy to share their views, and up to date on the news, especially related to the upcoming elections. Curious to take a look for myself, I decided to do a day trip to the border, to attend a border closing ceremony which has become something of a tourist attraction. Amritsar is just 30km from the Pakistan border, with Lahore just another 30km beyond that. I haven’t had time to investigate the full history of the ceremony, bit it’s become so popular that grandstands have been specially constructed on either side of the border to accommodate the hundreds of spectators that attend. The ceremony seemed to involve a lot of high-kicking, some gun twirling, much warming up of the audience, and each soldier take a turn to give an Arsenio Hall-style “Hindustan zindabad!” (“Long live India!”). Eventually, the flags on either side were ceremoniously lowered and the border was officially closed for the night. At no time was it was particularly clear what was happening, but there were a great many people there, and they were very excited about it! I was seated in a special section reserved for foreigners and VIPs. You can see the gate between the countries in the distance and the Indian border officers in the khaki uniforms and red headdresses. The guys in fatigues would come around periodically to make sure that people were staying more or less behind the rope and not blocking anyone’s view. The right side was a mirror image of the left, with giant Indian flags waving behind me. The audio was recorded during the warm up to the ceremony. It was all pretty intense and jingoistic, but seemed more celebratory than aggressive. The relationship between India and Pakistan is obviously complicated, but no one that I spoke to on the Indian side seemed overtly concerned. Although the regular meetings of the joint border control forces were temporarily suspended in the wake of the recent widely-reported violence, the next one has already been scheduled. There were two other bizarre aspects to the day trip. The first is that there were a large number of palatial resorts on the road between Amritsar and the border. Many where shaped like Mughal palaces, and one had a set of water slides! There was no evidence of any visitors, and I can’t quite imagine who would make use of them, but perhaps it wasn’t the season. 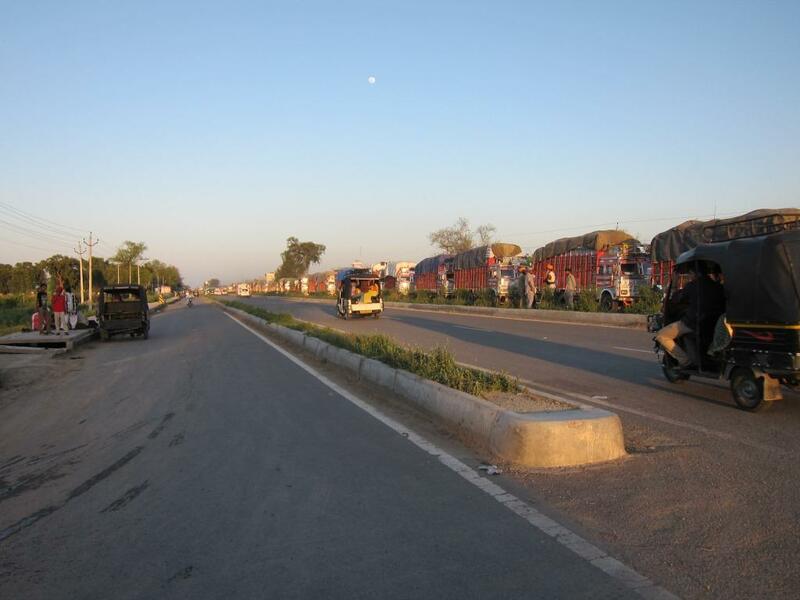 The second was the sight of literally hundreds (I think it was over a thousand) small transport trucks lined up along the side of the road, with their drivers sitting in the shadows. The ones coming from Pakistan were mostly empty, and the ones heading to Pakistan were full. Some were covered by opaque tarps or burlap. The ones that were not were completely full of bags of potatoes. I have no reason to doubt that the others were carrying anything else, but the sheer volume of tubers is hard to believe. Since the above photo was taken on the way back from the ceremony, I can only assume that these trucks were destined to be stuck there for the night. Having now traveled to five states in India across the East, South, and West, I can safely say that India is a far more diverse and complex place than I had ever imagined. In terms of religion, personalities, lifestyle, and cuisine, it’s sometimes hard to believe that this is all one country! As a traveler, the only constants seem to be the newspapers, the railways, and cricket. But then, as a book I recently finished by Meghnad Desai argues, what we now think of India fundamentally did not exist as a country until the British forged it into a nation. Certainly, such a large swath of territory had never previously been united under a single leadership in this part of the world, and the tensions which result from this are readily apparent. The protests I saw in Darjeeling were related to perceived injustices against the Gurkha people, possibly agitating for a separate Gurkha state within West Bengal. While I was in Kerala, the state parliament was debating making Malayalam the official language of the courts, rather than English or Hindi. And Punjab, itself divided at independence in 1947, and now further divided into Sikh-dominated Punjab and Hindu-dominated Haryana, has seen more than its share of separatist movements and state violence. By many accounts, far worse atrocities are ongoing in Jammu and Kashmir. While India can legitimately claim the title of the world’s largest democracy, everyone I met agreed that corruption rules, and that the Indian government has failed to deliver both equality and development. A recent article in The Hindu noted that globally, the Under Five Mortality Rate has declined by 35% in the past two decades, and that India has actually improved more than the average over that period of time. However, the average across India is still 59 deaths per 1,000 live births, with more than half occurring within the first month of life. Because of it’s population, this means that India accounts for nearly one-fifth of the world’s child deaths. Not surprisingly, there is tremendous variation both between and within states in India, with the worst statistics in the poorest and most remote places. Having had spent a mere six weeks in the country, I’m not in much of a position to comment, but from talking to people and reading the newspaper, it seemed clear that both the strengths and the tensions in the country have roots stretching back to pre-independence days and, in particular, the circumstances under which the country came into being. In some ways, India seems to be changing very quickly. Many tourists I met who were here twenty, ten, or even five years ago described the tremendous changes they noticed. At the same time, many of the most serious problems are long-standing and show few signs of being resolved in the near future. For me, it’s been an fascinating experience to have been a part of it for a small stretch of time. I didn’t get to half the places I thought of going to, but of course, there is never enough time. In brief, here is a quick list of the major destinations that I missed – Sikkim, the Northeast Tribal states, the entire East coast, Hampi, Mysore, Rajasthan, Leh, Ladakh, Dharamsala, Bombay, Delhi, and oh, the Taj Mahal. 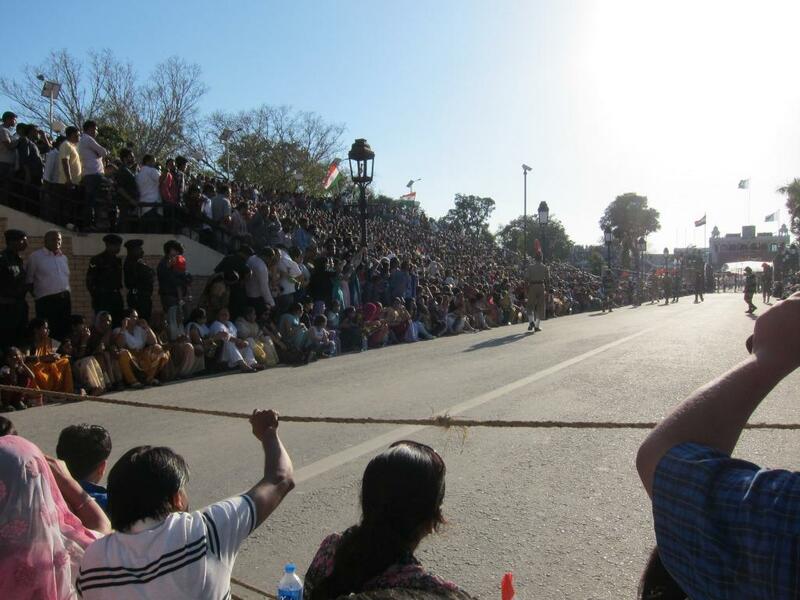 This entry was tagged border ceremony, golden temple, Pakistan, potatoes, punjab, Sikhism. Bookmark the permalink. Thanks for all the great posts! Your India experience was so different that mine, which I think underscores the diversity of the country that you mentioned near the end of this post. Awesome post, Dallas! I love your use of audio. Although it pales in comparison to actually being there in person, I admit that it did give me a more immersive appreciation of the experience, as I sit here thousands of miles away, longing for something more exotic than an office wall.